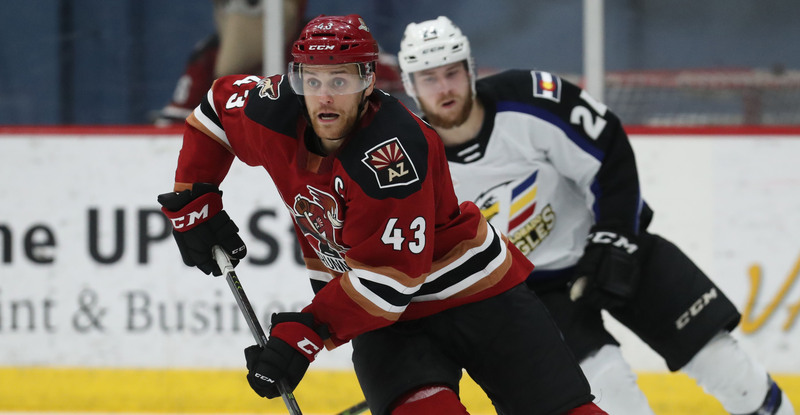 The Roadrunners dropped their first game back from the All-Star break by way of a 3-1 loss to the Colorado Eagles Friday night at Tucson Arena. Matched up against a hot goaltender in Spencer Martin, who has made a combined 146 saves in his last three starts, and a Colorado team that has been rather difficult to play against, the Roadrunners, despite putting 32 pucks on net, could not get into an offensive groove as they were held to just one goal for the third straight game. The Eagles took a 1-0 lead just prior to the midway mark of the first period when Jean-Christophe Beaudin snuck a puck past Adin Hill. In the late stages of the second period, the Roadrunners evened the score when Adam Helewka redirected Cam Dineen’s backhand shot as he served as a screen atop Colorado’s crease. For Helewka, it was his team-leading 13th goal of the season; he is just one goal shy of matching his single-season career high of 14, which he attained during his rookie campaign in 2016-17 with the San Jose Barracuda. Less than two minutes into the third, and while operating on a power play, Colorado’s Mark Alt struck to give the Eagles a 2-1 lead. Martin Kaut buried an empty-netter with 31.5 seconds left to give the Eagles a 3-1 lead, the night’s eventual final score. Adin Hill stopped 27 of the 29 shots he faced, suffering his fifth loss of the season. The Roadrunners have now lost three-straight games for just the second time all year. They are now situated at fourth-place in the Pacific Division, and are 2-5-0-0 against the Eagles this season. 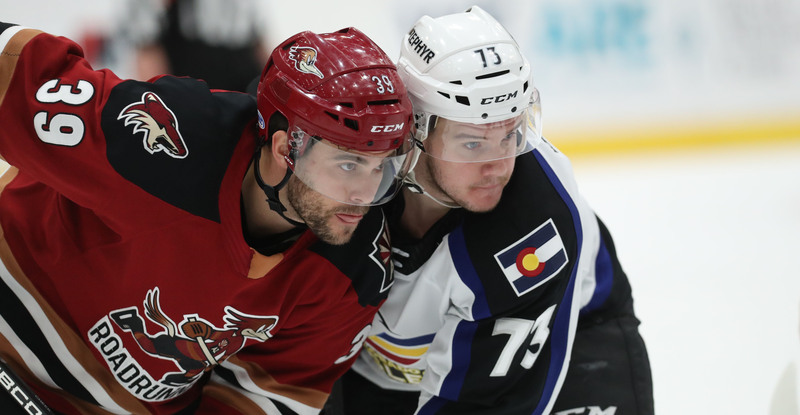 The teams will meet again on Saturday night at Tucson Arena, where the puck is scheduled to drop just after 7:05 PM.